Whether you own a property and need to maintain it or are in the market to purchase a property and intend to build on it, there are some major implications that can affect or alter your plans. One of the largest considerations that a developer should keep in mind is the soil quality on the location that they intend to develop. Check out one of our past blogs where we discuss soil quality and geotechnical design solutions in Webster. Here at CMI Structural Solutions, we provide geotechnical construction services and geotechnical design services to Webster and its surrounding areas in an effort to ensure that new and existing developments can avoid issues caused by soil instability like foundation repairs. While foundation repair is a geotechnical systems service that we offer, today we will be discussing our retention systems and shoring solutions services. 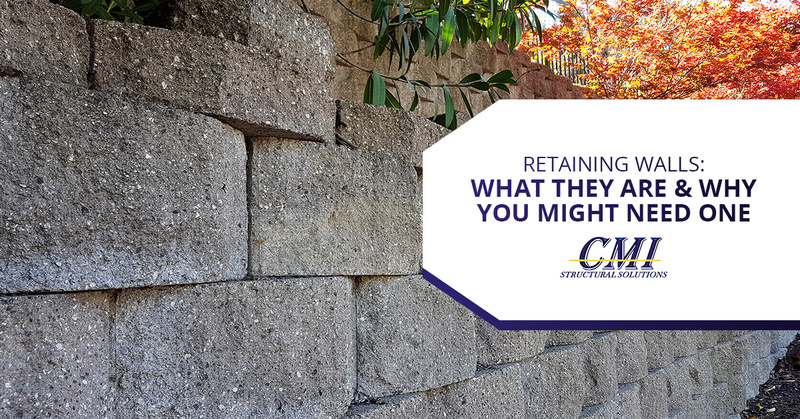 A retention system, in its simplest form, describes any system that holds back (retains) any material (usually soil) and prevents it from eroding or sliding away. Essentially a retention system is a counterforce against the natural gravity of soil to ensure that it does not move, maintaining its structural stability. While retention systems serve a seemingly simple purpose, there are many different kinds of retention systems that are specialized for different uses. Below, CMI Structural Solutions has compiled a list of the more common types of retention systems. Gravity Walls- A gravity wall is arguably one of the most basic retention systems as far as geotechnical construction is concerned. Designed for low impact soil situations, meaning the impacts of gravity on soil erosion is considerably low, gravity walls are built with stones, precast concrete, or any other stackable materials that only need gravity to maintain structural integrity. Reinforced Retaining Walls- Reinforced retaining walls consist of a structure (concrete, metal, wood, etc.) that is physically reinforced by a geotechnical system. One example of this geotechnical system is that of the Cantilever wall, a structure that uses the gravity of the soil to brace itself, or the Anchored wall where anchors shoot back into the hillside to once again counter the weight of the soil on the retention system. Soil Nailing- Soil nailing is one of the more interesting geotechnical systems as they can be used with both mesh and solid retaining walls. Soil nailing by definition is inserting long slender reinforcing bars into the side of a slope to anchor a containment structure. While the above retention systems are not the only geotechnical design structures that we utilize here at CMI Structural Solutions, they are a few of the most common. Now that we have discussed some of the permanent geotechnical construction retention solutions, let’s briefly address the more temporary retention solution that we offer. Shoring is a temporary structural retention solution that is commonly used in large excavation efforts, cross services, foundation repair, and protecting building facades. Shoring is essentially a geotechnical system that provides the temporary retention of soils or a structure while specific tasks are completed on the job site. Below, we have listed some of the more common shoring needs. Excavations- When a large-scale excavation is being conducted soil on the site becomes super variable as large machines pack down the soil causing it to shift laterally. If large piping is being installed in the ground it is likely for shoring trenches to be dug and reinforced to ensure that the trench does not collapse on the pipe before construction is complete. Additionally, shoring can be used to protect curing concrete foundations. Any Site Situation That Needs Temporary Support- We could continue to list other reasons that you may need our shoring services, but quite frankly that could take all day due to the specialized needs of individual projects. Instead, if you think that you have a situation that could benefit from shoring, contact us at CMI Structural Solutions and ask. We would be happy to help you decide if shoring is the right geotechnical system for your project. At CMI Structural Solutions, we provide retention system services that are second to none in the Webster area. We look forward to helping you with your next project. At CMI Structural Solutions, we pride ourselves on being your go-to geotechnical design and construction company in the Webster area. If you are working on a project that requires our shoring support services or our geotechnical construction and retaining services please contact us to speak with a member of our geotechnical design team, as we would be happy to further educate you in the services that we can provide to your company. To see a full list of our geotechnical systems services, please click here. We look forward to hearing from you soon and helping you with your next project. Contact us today for more information on our company, or to speak to a geotechnical system solution expert.